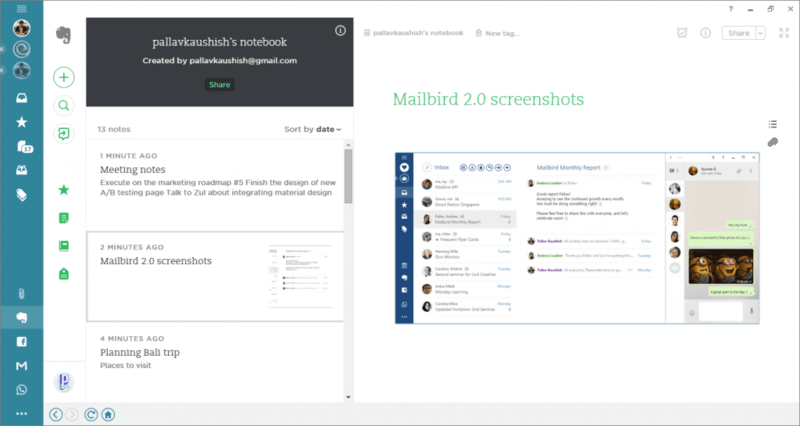 With the new Mailbird 2.0 release we started early integration with many new apps and one of the special ones have been Evernote – a workspace to organize your life’s work. 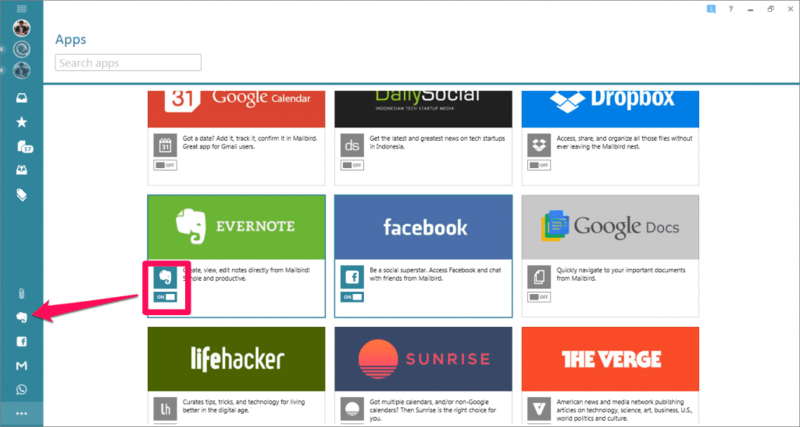 Evernote is present in the Mailbird app store and can easily be activated with a single click. Once you activate Evernote, a small icon will show up in the left pane which can directly take you to Evernote app whenever you want. Evernote is a powerful app to organize your documents, files, audio, video and everything else. You can write short lists or lengthy research paper inside Evernote but organizing it using bullet points and other text formatting options makes it simpler for you to check them off when you’re done. Using email as your to-do list has always been a bad practice so now you can do that with Evernote and best of all you don’t even need to go to your browser window. You can create different notebooks and start collecting images, videos in Evernote which you can then share with others via Facebook, Twitter, Linkedin, email or by directly sharing the link of the notebook. Collect your favorite web links and articles to reference later or to share them with others through Mailbird. You can either use different notebooks to collect similar type of information or you can tag them and segregate by tags. Click on ‘tags’ option at the top in any note as shown below. Add reminder to your notes so you don’t forget when you have to come back to them. Ready to take your productivity to next level? Try Evernote in Mailbird and let us know what you think in the comments below. 6 thoughts on "The power of Evernote in Mailbird"
It’s basically a way to navigate Evernote inside the app. It’s not integrated or anything. Would actually love to see that. Yea, how do you actually send an email message to evernote? 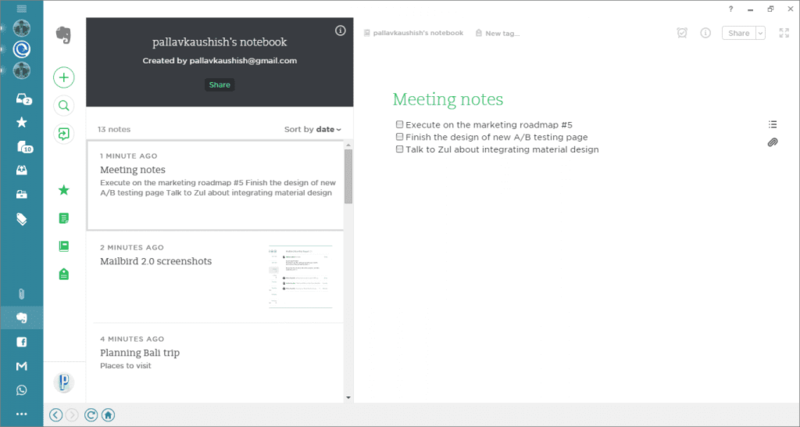 I’m not really seeing the integration aspect aside from it merely being an iframe of the evernote website. let users know if full App integration is on the cards or not. Ya to me this is not truly integration since you can not save email directly to evernote you will still have to send it to evernote. So this is not a plus for this product where postbox does go directly to evernote – back to drawing table boys! This is really a lame “integration” as it doesn’t provide an easy way to get mail from Mailbird to Evernote. If you’re going to add one evernote functionality to an email client, it should be that functionality. If I don’t keep Mailbird it’s because of this missing feature. It’s a shame it doesn’t actually integrate with mail, given that I use Evernote to archive old emails.